In a lot of ways, the helmet is as important a piece of equipment for cyclists as the bicycle itself. You should never, under any circumstances, go for a ride without your helmet. While helmets can be inconvenient at times?particularly if you are using your bicycle to reach a destination, rather than just riding for leisure or exercise? They turn cycling from a recklessly dangerous activity into a safe and conscientious one. Do take note bike helmets are not a one-size-fits-all type of product. Your helmet should fit snugly and not move around when you turn or shake your head. If your helmet does not have this kind of snug fit, replace it immediately. Drivers-in-training are always told to "drive defensively" out on the road, which essentially means staying aware of other drivers and potential hazards and always having a plan for avoiding an accident. The same principle applies to cycling. You need to keep an eye out for drivers making turns without signals, drivers running stop signs, or drivers rolling through red lights. Don't assume that drivers are going to stop for you?even when the rules of the road dictate that they should?and don't even assume that drivers see you at all. Instead, always be cautious and keep your eyes peeled, and be prepared to stop, slow down, or get yourself off the road if a danger should emerge. If you are going for a long bike ride on a trail where cars aren't permitted, it can be fun to let your guard down a bit, put in your earphones, and listen to music. Music can make exercising easier and more enjoyable, and is a core source of inspiration for many cyclists and runners alike. However, if you are going cycling on a high-traffic road, it's best to leave your smartphone or mp3 player at home. Part of biking defensively is knowing what is going on around you at all times, and it's tough to do that when you remove one of your core senses from the equation altogether. With your headphones in, you might not be able to hear a car honking at you or a person shouting to alert you to a safety hazard. As mentioned above, you can't always rely on other drivers to see you. 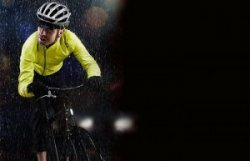 However, you can make yourself hard to ignore by dressing in bright-colored clothing in any weather conditions, wearing reflective clothing in low-light or inclement weather conditions, and using bike lights to mark your position when riding at night. None of these precautions will guarantee that drivers will see you, particularly at night or in the early morning. As a result, it's probably advisable that you only go cycling on main roads or in high-traffic areas when daylight is on your side. If you can't follow that rule, though, just do everything you can to make yourself visible. Many cyclists, for whatever reason, think that only some of the rules of the road apply to them. If you are planning on cycling alongside or as part of motorized traffic, though, you are beholden to the same rules as you would be if you were driving a car. In other words, you have to stop at red lights or stop signs, you have to use turn signals (Google for videos on cycling arm signals, if you are not familiar with them), and you have to travel with the flow of traffic, not against it. Following these rules will not only earn you more respect from drivers, but it might also be what keeps you alive. With the proper concentration, awareness, and etiquette, cycling can be a safe, fun, and athletically fulfilling activity. For some people, cycling is even a primary mode of transportation! Just keep the above tips in mind before you head out on the road, to ensure that you are always giving yourself the best chance possible at avoiding accidents or other safety hazards.